WHY I LOVED IT: For starters this may literally be the first pop-rock album I can remember having, not a huge shock considering I was all of nine years old when it was released. “Too Much Time On My Hands” may very well be the first cool rock song I remember. If nothing else it certainly was the first to make pause whatever I was doing and alternate playing the air-drums and air-synthesizer. Sure it was cheesy but God I loved that song! I probably like “The Best of Times” now more than I did back then, which is saying plenty because I liked it back in the early 80s as well. Some say Styx isn’t a band that ages very well. I couldn’t agree less. 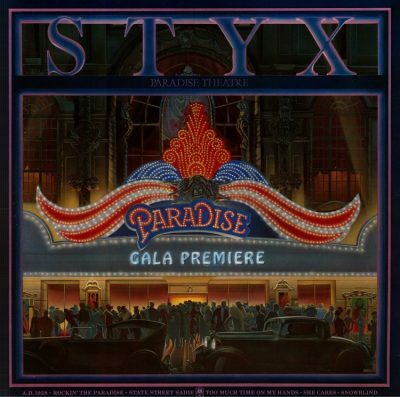 There’s few albums that have allowed me to enjoy the nostalgia of my youth more than Paradise Theater. By the way, don’t sleep on “Snowblind”, which may be the most underrated song the band ever recorded. COMMERCIAL SUCCESS: Released on January 1981 I was shocked to learn this was already Styxx’s 10th studio album, and it went on to become their lone Billboard Top 200 number-one album, where it spend a total of three weeks on top. Paradise Theater spawned four charting singles, led by “The Best of Times”, which reached three on the Billboard Hot 100. “Too Much Time On My Hands” peaked at nine on the Billboard Hot 100 while “Nothing Ever Goes As Planned” maxed out at No. 54. “Rockin The Paradise” climbed up to eight on the Billboard Top Rock Track Chart. In total Paradise Theater sold more than three million copoies in the United States.